Investigations are underway following an incident at Winsford Lifestyle Centre on Tuesday 10th March. Shortly after 2 pm police, ambulance and crews from Cheshire Fire and Rescue Service responded to reports of a number of children becoming unwell at the Winsford Lifestyle Centre. It is understood that around 56 children from Winsford High Street Primary School were at the centre for swimming lessons. 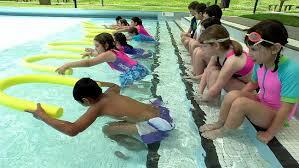 Most were poolside when a small group in the water began coughing. All 56 were taken to a rest centre set up at nearby Wyvern House for a medical examination and the majority were allowed to go home. 10 children and one adult were taken to Leighton Hospital in Crewe with respiratory problems and for ‘further assessment of non-serious injuries’ after initial checks of each person. Low suction in the balance tanks may have caused a build-up of the higher level of combined chlorine and subsequent odour in the pool hall environment, which was caused by a technical issue with the suction in the balance tank and this will be rectified by an engineer. As a precaution, the balance tanks have now been drained and refilled with fresh water. Both pools at Winsford Lifestyle Centre (which is run by Brio Leisure) were reopened as normal on Wednesday morning. The 10 Children taken to hospital were not found to be in a serious condition and all allowed home after several hours of observation. Half were back at school the following day while the others recuperated at home. The the new £10.8million Winsford Lifestyle Centre replace the old Winsford sports centre seven years ago – when developer Morgan Ashurst handed the keys over to Vale Royal Borough Council. 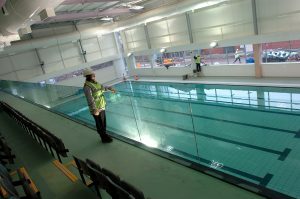 Desco were the consulting engineers appointed to deliver the M&E services and pool water consultancy at the time of the pool’s construction. an industry expert explained to Stonehewer Moss. It would seem likely that this is the result of an accident or negligence. This article was added on Thursday, March 12th, 2015 at 10:54 am and is categorised under Cheshire News, General News, Winsford News. Both comments and pings are currently closed. Error: Error validating access token: Session has expired on Saturday, 09-Mar-19 13:12:58 PST. The current time is Thursday, 25-Apr-19 10:05:14 PDT.